This explosive, powerhouse prison film effectively reunites a large number of cast and crew from the previous year’s The Killers: producer Mark Hellinger, composer Miklos Rózsa, screenwriter Richard Brooks (uncredited for his Killers work), star Burt Lancaster and actors Edmond O’Brien, Sam Levene and Charles McGraw. 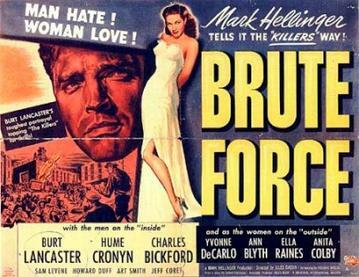 Based on the notorious “Battle of Alcatraz,” an attempted prison break that devolved into a riot, leaving numerous guards and prisoners alike dead and wounded, Brute Force quickly establishes its basic premise: life “in stir” is at bottom nothing more or less than a mirror image of society on the outside. This is established effectively (via conferences involving the warden, always first and foremost concerned about his position, a “machine” politico, the head guard and the prison doctor) and ineffectively (the outrageously direct-address homilies delivered by the aforementioned doctor). Further points will have to be subtracted for a saccharine device that allows each inmate of cell R17 a flashback (complete with one guest-starring “dame” per) illustrating their former lives. This gimmick serves no real narrative purpose, other than to insert some cheesecake into an otherwise testosterone-fueled exposé, thus assuring some crossover demographic appeal. The final twenty minutes of the film detail the attempted prison break/riot–and they are unlike anything else in 1940s Hollywood cinema, a devastating (and, yes, brutal) portrait of uncompromising violence and desperation. By this point, it’s clear to everyone involved that the scheme is hopeless–another informer has tipped Munsey to the details. Instead of backing down and returning to the infernal conditions they know, the Breakout Bunch follow the course to its inevitable conclusion: their own extermination. Like the philosopher Jean-Paul Sartre, these men have found that hell is indeed confinement with other people, and they have also realized that a man’s being is determined not by who he is but rather by what he does: “[Man] is therefore nothing else but the sum of his actions,” as Sartre put it. These existentialist beliefs find their clearest visual correlative in the film’s final post-riot scene. The camera pans across a tier of cells, passing without pause the now-empty R17, before halting before a cell where the prison doctor tends to the wounds of Calypso, who along with the doctor has served as the film’s “Greek chorus.” They discuss recent events. The doctor wonders what the escapees hoped to gain. Calypso says their freedom. As the doctor once again approaches the camera for direct address, it retreats, tracking back to enclose the doctor and the prisoner behind bars. The doctor’s final words are: “Nobody escapes. Nobody ever really escapes.” The final shot shows the city across the river. This vista may stand as the image of freedom–what Joe Collins (Burt Lancaster) and company wished for most. And then, too, it might also serve another purpose: To suggest that the plight of the denizens of that Asphalt Jungle so tantalizingly just out of reach is in no way fundamentally dissimilar to that of the imprisoned. This entry was posted in film, movie reviews and tagged asphalt jungle, battle of alcatraz, brute force, burt lancaster, charles mcgraw, edmond o'brien, existentialism, hamlet, hume cronyn, jean-paul sartre, jules dassin, mark hellinger, miklos rozsa, richard brooks, richard wagner, sam levene, tannhauser overture, the killers, william shakespeare. Bookmark the permalink.